A timely text on the recent developments in data storage, from a materials perspective Ever-increasing amounts of data storage on hard disk have been made possible largely due to the immense technological advances in the field of data storage materials. 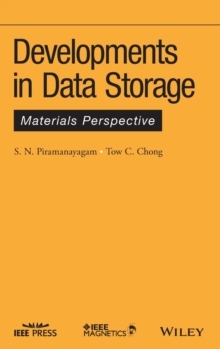 Developments in Data Storage: Materials Perspective covers the recent progress and developments in recording technologies, including the emerging non-volatile memory, which could potentially become storage technologies of the future. Featuring contributions from experts around the globe, this book provides engineers and graduate students in materials science and electrical engineering a solid foundation for grasping the subject. The book begins with the basics of magnetism and recording technology, setting the stage for the following chapters on existing methods and related research topics. These chapters focus on perpendicular recording media to underscore the current trend of hard disk media; read sensors, with descriptions of their fundamental principles and challenges; and write head, which addresses the advanced concepts for writing data in magnetic recording. Two chapters are devoted to the highly challenging area in hard disk drives of tribology, which deals with reliability, corrosion, and wear-resistance of the head and media. Next, the book provides an overview of the emerging technologies, such as heat-assisted magnetic recording and bit-patterned media recording. Non-volatile memory has emerged as a promising alternative storage option for certain device applications; two chapters are dedicated to non-volatile memory technologies such as the phase-change and the magnetic random access memories. With a strong focus on the fundamentals along with an overview of research topics, Developments in Data Storage is an ideal reference for graduate students or beginners in the field of magnetic recording. It also serves as an invaluable reference for future storage technologies including non-volatile memories.